Bottom Line: This community owned park was renovated in 2010. The new play features are nice, but the selling point for my boys was the access to the bike path -- a good place to practice bike/glider skills. 4/5 stars. 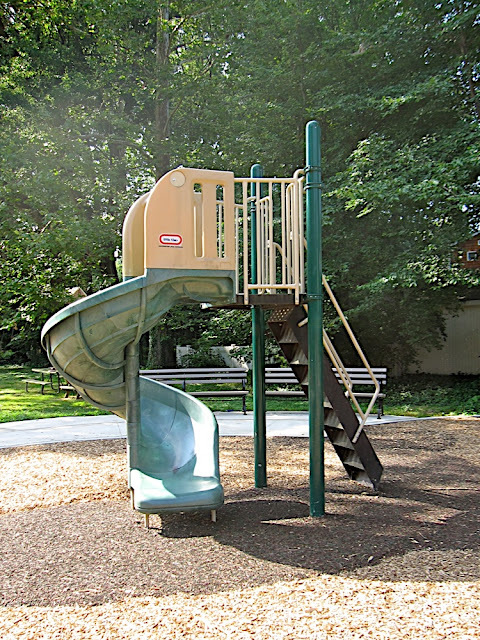 This park isn’t on the county list of Arlington parks and playgrounds because it is owned by the Dominion Hills Civic Association. However, it was upgraded by the county as part of its Neighborhood Conservation Program. According to the county list of completed projects, this renovation was finished in June 2010, although when we visited in July, it still had construction fencing up, presumably to give the grassy area time to grow. Since this was our first visit to the park, I can’t compare it to pre-renovation, but my impression is this is a nice little park to visit, preferably in the afternoon, when the trees offer more shade. It was a hot and sunny morning the day I stopped by, and there was little shade to be found. My older kids were in camp, so it was just Adam (the 2 year old) and I. We first checked out the play structure for the younger crowd. It looked like it must have been there pre-renovation — it looked a bit aged and dated, despite the new sign. There was a teeter totter that Adam enjoyed – he probably would have liked it more if he had a partner (the park was empty when we got there). There are two ride-on bouncy things – a car and a bulldozer. Adam enjoyed them, but they didn’t seem to be seated properly in the ground. The base was above the mulch, which meant the seats themselves were rather high. You can see in the picture below, someone pulled a kiddie slide next to it to help kids get up on it. Behind the bouncy toys you can see a set of swings – 2 regular and 2 bucket swings. Behind the swings, there was some plastic play equipment donated by the locals. 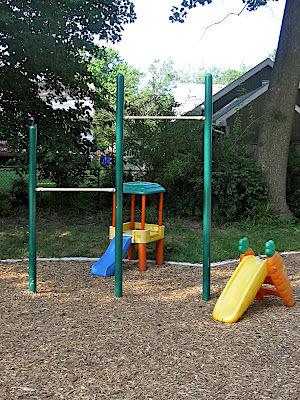 Next to the swings, there is a set of chin-up bars, for those wanting to work their biceps while the kiddies play. There is a lone twisty slide, which Adam wasn’t interested in. The most obvious new feature is a new play structure, designed for 5-12 year olds. The new trend in playground equipment, it seems, is to build open ended play areas where kids can climb and play creatively. It has web netting, a twisy turny thingee, and mushroom stools for climbing. There is also a nice sized sand lot. Paved paths around the park were also part of the renovation. The path into the park looks like a giant snake. Adam had fun at the park, but with it being a hot day, we both got restless pretty quick. We had his glider, so we decided to explore the trails adjacent to the park. Another bonus was the trail was mostly shady, so it was a good way to keep us out of the sun. So, while Dominion Hills Park is a nice little spot, the trail was a highlight for us. I’m sure we’ll be back (most likely in the late afternoon/evening), since my daughter has been looking at these pictures and begging me to take her there. "Dominion Hills / Mace Park (22205)", 5 out of 5 based on 1 ratings.